Sharing Knowledge and Experience. A Profile of Kwabena Nketia. Kwabena Nketia is a renowned scholar, linguist, composer, poet, researcher, teacher and musicologist in Ghana. His writings have become standard reference works on African musicology, and his work has spanned many countries and interests. Nketia maintained a strong interest in Afro-American concerns, African musical traditions and Africans and blacks in the diaspora; and he has worked tirelessly on establishing a theoretical framework of African music; consciousness of African identity in music; and to produce publications representing his own musical culture. 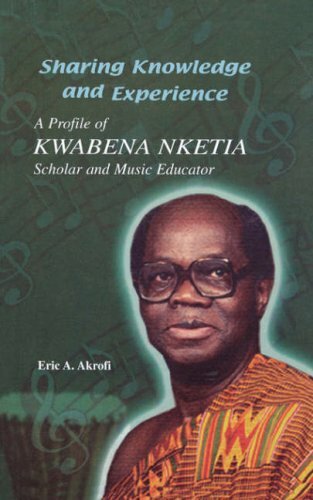 This biography concentrates on the educational and research aspects of Nketia's work, assessing the importance of his contribution to African musicology, thought on music education, and practical application of ethnomusicology and composition in teaching method, and exercises in African rhythm.